A Mexican NGO has recently seen years of hard work pay off with the opening of the voluntary carbon market in 2008 and recognition from Mexico’s National Forest Commission in 2010. But getting to this place involved overcoming many complexities of the carbon market. This article originally appeared in Grassroots Development, the journal of the Inter-American Foundation. 11 July 2012 | Environmental Services of Oaxaca (SAO), a small Mexican nongovernmental organization, has had some pretty good years recently. In 2008 it pioneered the opening of the “voluntary” carbon market in Mexico, selling carbon credits from 10 rural communities to corporations and other Mexican buyers. Mexico’s National Forest Commission (CONAFOR) highlighted SAO’s accomplishments at the 2010 United Nations Climate Change Conference held in Cancun. As a result of that Fundacií³n Coca Cola later delivered SAO a check for some $150,000, representing the cost of planting trees to offset the carbon generated by the jets transporting delegates from around the world to Mexico. To the five NGOs and community organizations who had founded SAO and invested years of work in it, all this meant that their bet had paid off. Poor coffee farmers and community logging operations had become players in sophisticated markets for forest carbon, and were recognized for doing their part to capture emissions that were heating up the atmosphere. But getting to this point has not been easy, and many complexities still lie ahead. SAO was legally incorporated in 2000, a good time to jump into carbon markets, it seemed. The Kyoto Protocol signed three years earlier appeared to have opened the door through its Clean Development Mechanism (CDM). The idea was to allow contaminating industries in the developed countries to decide on the most cost-effective method of reducing their carbon emissions by, for example, investing in alternative energy sources (such as wind or solar) or by paying a party in a developing country to offset their emissions through activities such as planting trees, resulting in the “carbon credits” mentioned above. The exotic notion of carbon credits is rooted in the need to address global warming. Scientists don’t commonly agree on much but the vast majority of climate scientists project that if emissions continue at current rates, global temperatures could increase between 2 and 11 degrees by 2100, the seas could rise by between 3 and 18 feet, and massive droughts will become even more frequent than they already are. Polar ice caps are in fact melting faster and extreme weather events are occurring earlier than projected, suggesting the scientists have been conservative. Elementary science classes teach how plants, through photosynthesis, convert carbon dioxide into organic compounds that build the plant. About half of the biomass of plants is carbon. This uptake of carbon from the atmosphere is an “environmental service” that helps stabilize global climate. As trees are felled and burned to create space for agriculture, the carbon stored in them via photosynthesis is released into the atmosphere. Deforestation is estimated to be the source of some 20 percent of all global carbon emissions. This points to the urgency to create incentives to preserve forests and to plant more trees. Thus has been launched a slow, painful effort to create markets for forest carbon—both “compliance” markets per the CDM, and so-called voluntary markets, where standards are more flexible. The new global initiative called REDD + (Reduction of Emissions from Deforestation and Degradation plus conservation, sustainable forest management and enhancement of carbon stocks) contemplates a compliance market, strictly regulated by internationally agreed-upon protocols. The architects of REDD+ are looking at the massive multiplication of models like SAO for capturing carbon. SAO’s founders had experience capturing carbon, although until 2000 only in connection with shade-grown coffee plants and the production of timber. Several founders worked as advisors and staff with the State Coordination of Coffee Producers of Oaxaca (CEPCO) and the timber producers of the Zapotec-Chinantec Union (UZACHI), both of which had received support from the Inter-American Foundation. So it seemed a logical next step to explore the possibility of income from another product of their farms and forests. The Ford Foundation quickly bought into this novel idea and gave SAO modest support to organize an office and begin educating communities on this odd and vaporous commodity captured by the forest: metric tons of carbon dioxide. Other donors followed suit, and SAO held workshops in communities served by CEPCO and UZACHI to recruit volunteers for the new initiative. The unusual proposal met with suspicion; assemblies of the community members, who held legal title to the territory, often feared it involved an elaborate plot to take away their lands. Finally, during 2002 and 2003, 10 communities stepped forward, ready to take the risk. Their residents, who lived from coffee or timber production, were mostly poor and of indigenous descent. They spoke Zapotec, Chinantec and Mixe and had a lot to learn about the language of international carbon markets. Initial benefits finally started to flow in 2003 and 2004, when CONAFOR began priming the pump for forest-carbon projects by funding organizations, such as SAO, that provided technical assistance and subsidized community tree-planting. Then, uncertainty in international carbon markets caused CONAFOR to tighten requirements and by 2008 the program had ended. NGOs offering technical assistance were encouraged to find buyers on their own, which was not easy. “SAO was designed to reach out to the international market but on the road we found that it was extremely complicated under the CDM. So we realized that wasn’t the way for us,” noted Carlos Marcelo Pérez Gonzí¡lez, one of SAO’s founders and its coordinator since 2003. Thus began the quest to stimulate a Mexican voluntary market, a national clientele interested in SAO’s blend of traditional community conservation and development that also yielded measurable carbon offsets. Developing the ability to maximize the capture of carbon included improving the communities’ capacity to manage forests both for carbon and other uses. This meant time-consuming participatory processes of zoning land for agriculture and forests, drafting rules, creating nurseries and using hand-held geographic position systems to mark forest boundaries in remote images. Through multiple workshops, community members with a grade-school education learned about the carbon cycle and the concept of payment for planting trees and protecting forests. The communities, with tongue-twisting names like Santa Maria Tlahuitoltepec and San Miguel Malinaltepec, are in the rugged sierra of Oaxaca. They figure among the thousands of communities, indigenous and nonindigenous, that own some 60 percent of Mexico’s forests. Their strong governance institutions are rooted in ancient tradition and contemporary agrarian law. Ownership of their territories, secured by clear title granted under the Mexican Constitution, is a defining aspect of their lives, assuring their identity and their place in the world. Powerful norms of cooperation are reinforced through sometimes strict rules promulgated by community assemblies and elected authorities. These Mexicans are also distinguished by a tradition of obligatory service, known as tequio, which provides the labor to maintain community infrastructure. In recent years, as a consequence of becoming more aware of the importance of environmental stewardship in the contemporary context, they have incorporated practices leading to the certification of their coffee as organic and their logging practices as well-managed. SAO’s staff knew from its experience with coffee and timber that working with the communities requires careful attention to their governance institutions. When trees are planted on community land, the entire general assembly of all legal residents must understand and approve the activity. And while coffee is grown on plots assigned to specific families, most of the communities have cooperatives whose producer-members had to be educated and consulted. New practices for storing carbon had to be mastered for each ecosystem; saplings had to be planted in degraded areas and forests had to be thinned and managed for more rapid accumulation of carbon, but without jeopardizing biodiversity. In systems of coffee agroforestry, SAO had to work with individual farmers on enriching shade with fruit trees that removed carbon from the air and added diversity to diets, and on planting living fences to check soil erosion. In timber-producing communities, like La Trinidad, calculating the harvest rotation to accumulate carbon required close consultation with the community forest managers. SAO also did broader development work, such as organizing women’s groups to sell tree resins. Offering the intensive training required to build knowledge and develop institutions for producing carbon credits, incurs a cost not covered in the market price. Biodiversity and educational and organizational advances associated with a carbon project are known as “co-benefits”, in addition to the main business of producing carbon. While buyers may appreciate these co-benefits, they are not necessarily willing to pay for them. Because of the costs and challenges of working with communities, only a minority of carbon projects involve them, as the Ecosystem Marketplace noted in its 2011 report, State of the Forest Carbon Markets. But the complexities of working with communities paled in comparison with what SAO found as it tested the rigors of the compliance market and then the turbulence of the voluntary markets. Forest carbon had largely been left out of the CDM. Very few projects involving forest carbon have survived the CDM’s approval process because of concerns about permanence—forests can burn down—and “leakage,” a reference to what happens when conservation in one wooded area prompts farmers to deforest another. In contrast, an alternative energy source for a factory implies a permanent ongoing reduction of carbon emissions. Thus, most of the action with forest carbon has not been in the compliance market created by the CDM, but in the voluntary market. 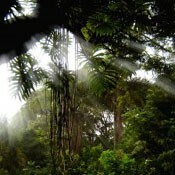 Forest carbon was rescued from near oblivion at the United Nations Climate Change Conference held in Bali in 2007, when representatives for Costa Rica and Papua New Guinea made a dramatic plea for the inclusion of forests in the negotiations, given their importance in many developing countries. This gave rise to the ongoing international talks involving REDD+, mentioned above. Given that forest carbon is a commodity invisible to consumers, extraordinary effort, with high transaction costs, goes into creating a paper trail designed to reassure investors. First, the seller who wants to trade in the international marketplace needs to choose from among a confusing array of standards for quantifying forest carbon. Each standard involves a particular methodology that guides the calculation of a pre-existing baseline carbon stock, projections of a counterfactual “businessas-usual” scenario (i.e., what would happen if there were no project), measuring and monitoring changes in carbon stocks, and assessment of leakage, among other technically demanding tasks. The Verified Carbon Standard (VCS), the most widely used, includes a range of methodologies applicable to specific scenarios, from which a prospective seller must choose. Other standards provide greater or lesser flexibility that allow developers to fashion their own methodologies subject to technical review and approval by auditors. In order to demonstrate that the project planned conforms to both the standard and the methodology, the seller must produce a detailed “Project Document” (PD). An accredited auditor must review the document, conduct a field visit to confirm the activities described and issue an opinion to “validate” the project—paid for by the proponent. The Sierra Gorda Ecological Group, a Mexican NGO working with farmers in the state of Queretaro, required three years to obtain validation under the VCS and, for the social and environmental co-benefits, under the Climate, Community and Biodiversity (CCB) standards. Validation qualifies a project to be registered with a clearinghouse, which provides a legal platform for the exchange between buyer and seller. But you are not done! Under some standards, the actual production of carbon credit must be “verified” through “MRV,” or ongoing internal monitoring, reporting and verification, and then an audit that includes a site visit approximately every five years for the duration of the project. Protocols proposed for the “compliance” market demand 100 years of monitoring after the period during which credits have been issued. Standards for “voluntary” markets typically require MRV last between 30 and 50 years. In addition to the carbon, some buyers want co-benefits validated and verified, as in the case of Sierra Gorda and pay a premium for the additional documentation and ongoing MRV. All this and more has led The Munden Project, a group that has extensively analyzed the development of carbon markets, to conclude that “forest-carbon trading is unworkable as currently constructed” and that “the commodity-based approach is at loggerheads with the development benefits REDD is expected to generate.” Even when the market works, communities that capture small volumes of carbon will fare the same as producers who sell small amounts of any agricultural commodity in markets dominated by intermediaries. They receive a minute portion of the final price, and little remains to invest in community development. So how has a little NGO like SAO been able to survive in the face of this complexity? By being in the vanguard of experimentation with the methods and institutional arrangements leading to the creation of a voluntary market in Mexico, and by blurring the line between traditional community conservation and development and projects focused on forest-carbon offsets. Walking this line has enabled SAO, at least for now, to avoid the paralyzing and costly complexity of international markets that might as well be labeled “this site under construction.” The design of its baseline inventory, for example, uses a method that J. Antonio Benjamí­n Ordí³í±ez Dí­az, who now works for the NGO Pronatura Mexico, derived from standards developed by the International Panel on Climate Change (IPCC) (as are most standards). “It took me five years to develop the model,” Ordí³í±ez explained recently, “but then we realized it was too difficult for the average person. So I adapted it to a simple Excel sheet. Now a community member can measure the diameter, the height and the carbon content of the trees, and if he knows the growth per hectare he can calculate the carbon capture. The calculation tables are very simple and training takes place in the indigenous language of the community.” Ordí³í±ez’s method has not yet been validated or verified by an independent authority as international standards require. It’s only recognition comes from CONAFOR, which is well aware of the conflict presented by its interest in SAO’s success. So for now a more flexible and quicker mechanism has been created, but one not ready for international markets. However, with work by Ordoí±ez and Pronatura, the method was sufficiently valid for acceptance in opening the Mexican voluntary market for SAO’s carbon producers. After SAO and Pronatura’s assiduous courtship of the business sector in 2008 and 2009, three large corporations—Televisa, Gamesa (a large bakery) and Chinoin Pharmaceuticals—as well as the Office of the President of Mexico and several individuals, purchased carbon bonds. SAO’s first big sale, in May 2008, moved more than 15,000 metric tons at $10 a ton, (when the going rate averaged around $3.80 a ton). As of the end of 2011, SAO had sold 104,842 metric tons of carbon for a total of almost $647,000. SAO and Pronatura each retain 10 percent of the revenue, which does not cover overhead, while the communities receive 80 percent. For fiscal reasons, Mexican corporations buy only a year’s volume of carbon at a time, although they have made informal commitments for longer periods. Thus, the current practice does not obligate the communities to protect the forest beyond one year. So what is the risk that they would just cut them down in coming years if they need the land for corn? In January, I visited the community of San Bartolomé Loxicha, a SAO partner in the Sierra Sur of Oaxaca, a few hours from the city of Oaxaca to explore this question. I traveled off the main highway over rough dirt roads toward the Pacific coast through a rugged mountain landscape with broad swaths of degraded agricultural lands where coffee agroforests provide much of the surviving cover. San Bartolomé is an indigenous Zapotec community of some 2,500 inhabitants, whose title to its land dates from 1712 and whose possession goes back centuries before that. Almost everyone in the village makes a living the hard way, by farming corn and coffee. Often the harvests don’t provide support for a full year, so income from family members who have emigrated to northern Mexico and the United States makes up the shortfall. When I visited, Amadeo Cruz Antonio, chair of the Oversight Council, one of the governing entities elected by San Bartolomé’s assembly, met us with traditional courtesy in the modest office of the community’s leadership. Later that day and the next, he and others conducted a tour of the 2,052 acres of forests and coffee farms now being managed for carbon accumulation. He explained how new attention to the forests and farms was stimulated by the carbon sales. As we visited several parcels under management for carbon capture, Amadeo explained how the community has used its revenue from carbon sales: 70 percent is reinvested in the forest, 20 percent is invested in community projects and 10 percent covers the expenses incurred by the community authorities. But there are no giveaways here; people have to work to get the benefits. The carbon project relies on the normally unpaid tequio for the considerable planting and maintenance of the forest required to assure the most rapid accumulation of biomass. But for the substantial additional labor needed, community members receive $12 a day, the going wage for farm work, modest income that lets some remain in San Bartolomé rather than emigrate. Assignments rotate so that every one of the community’s 500 legal members has the opportunity to work and be compensated in cash a few weeks a year. Different practices are required in the coffee fields. The leaders of the coffee-farmers’ organization, grandly called Café del Milenio, took us to visit the sites where members produce coffee certified as organic and now also trees that capture carbon. “Conservation zones,” Israel Cruz Garcí­a, 37, president of Café del Milenio, proudly called the areas comprised of parcels planted with the shade trees important to biodiversity in landscapes otherwise characterized by isolated patches of forest. The new culture of conservation promoted by SAO undergirds permanence beyond that which would be required in the contracts for international markets for forest carbon. Mexican buyers are convinced that the communities will not be cutting down the forests for corn, and are willing to invest in the “co-benefits” of that culture. SAO must still find its way through a thicket of complications in order to survive, to continue supporting its 10 collaborating communities, and to expand its influence. Thus far, Mexican markets have functioned based on a high degree of trust. Representatives of SAO’s Mexican corporate clients have visited SAO and the communities, have seen the forests and the shade trees in coffee fields, and have witnessed the multiple co-benefits of their investment. CONAFOR’s current arrangements with Pronatura Mexico and SAO have also evolved in an atmosphere of trust. But for the Mexican market to grow, its framework must depend on more than trust. Aspects of this experimental phase would raise conflicts of interest in international markets, and these must all be sorted out and clarified. CONAFOR is currently working on a framework for validation and verification for the Mexican market that could also be acceptable internationally, as well as a transparent national registry. It is also adapting international standards for a national “solidarity” market characterized by flexibility and trust. SAO’s own role in the market needs to be better defined. It now acts as the seller of the carbon credits, while disclaiming “ownership.” Plans are afoot to organize SAO’s partner communities into a single entity that can legally sell the carbon credits, with SAO in the role of verifier for the Mexican market. With considerable understatement, the Ecosystem Marketplace has noted that “the future shape, size and scope of the global forest-carbon marketplace remain highly uncertain.” Given this uncertainty, the report notes “a trend towards regions buying credits from their own backyards.” It is in that backyard that SAO has been tinkering with how carbon markets can serve community development. By trying to link community conservation and development and the demands of international carbon markets, SAO has sharpened the focus of the discussion about how carbon markets can serve the poor. As a small NGO it has become, along with the Sierra Gorda Ecologic Group, a pioneer in developing a Mexican market that can become an important model for other developing countries with substantial private sectors, such as Brazil and China. The REDD+ plans being developed in global forums are focused strict compliance protocols and assume that markets alone can reduce deforestation and channel benefits to poor communities. David Barton Bray, a former IAF representative, is a professor in the Department of Earth and Environment at Florida International University. He thanks Leticia Gutiérrez Lorandi, Bryan Foster, J. Antonio Benjamin Ordoí±ez Dí­az and David Ross for their contributions to this article.